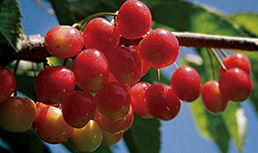 We grow a wide variety of cherries to maximize the length of our season. 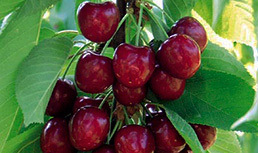 Chelan ~ 'Chelan' is our first cherry we harvest in The Dalles. It has good taste and firm flesh. 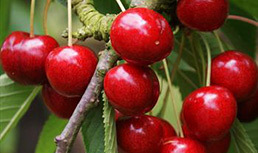 These qualities make 'Chelan' a good early season cherry which is available in Oregon in Mid-June. Bing ~ 'Bing' is the go to variety in the United States if not the world. 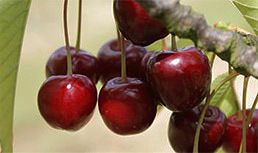 It is the number one cherry grown in the US because of its excellent flavor and firmness. Its firmness allows for easy shipping without damaging the quality of the cherry. 'Bing' is available in Oregon late June to early July. 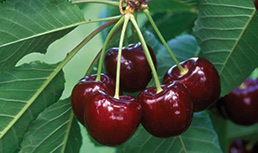 Sweetheart ~ 'Sweetheart' is our latest ripening variety of cherry. It has light mahogany skin color and excellent, strong flavor. We take special care in harvesting 'Sweetheart' because it is relatively fragile compared to 'Bing'. 'Sweetheart' is available in Oregon in Early August. Benton ~ 'Benton' is an excellent variety competing with 'Bing' for shelf space. Argued by many to have better flavor than 'Bing' and eqully firm. This may be a variety you hear more about in the future. 'Benton' is available in Oregon in late June. 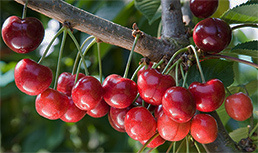 Regina ~A great cherry for consumers and growers alike. 'Regina' ships very well and maintains great quality. It has great eating qualities because of its firmness and flavor. It is available at the end of our season, late July to Mid August. So don't miss out on the last great cherries of the year! 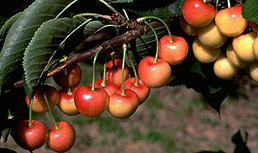 Rainier ~ Rainier cherries are yellow inside and out, with just a bit of red blush on them, and exceptionally large. They are quite sweet and very firm. Early Robin ~ Early Robin is a newer varieity and has shown promise as an early 'Rainier' style cherry. It is sweeter than 'Rainier' and relatively firm. 'Early Robin' is available in Oregon in late June. 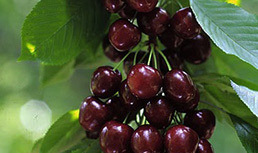 Skeena ~ Discovered by researchers at the Agriculture Canada Research Station in Summerland, British Columbia, in the mid-1990’s, the Skeena cherry variety is a cross between the Bing, Stella, and Van varieties. Skeena cherries have a deep mahogany color and sweet flavor with lower acid levels than other dark-sweet cherry varieties.